Spirits giant Diageo has announced plans to invest £150m over three years to "transform" its Scotch whisky visitor offerings. 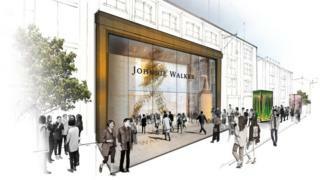 The centrepiece will be a Johnnie Walker "immersive visitor experience" based in Edinburgh, highlighting the story of the whisky brand. Diageo will also upgrade its network of 12 distillery visitor centres. The company said it was the "biggest concerted programme ever seen in Scotland's whisky tourism sector". Four distilleries - Glenkinchie, Cardhu, Caol Ila and Clynelish - will be linked directly to the Johnnie Walker venue in Edinburgh, representing the "four corners of Scotland". Diageo hopes the move will encourage visitors to travel to Scotland's "extraordinary" rural communities. Other visitor distilleries, including Lagavulin, Talisker, Glen Ord, Oban, Dalwhinnie, Blair Athol, Cragganmore and Royal Lochnagar, will also see investment to support the growth of single malt Scotch whisky. Diageo chief executive Ivan Menezes said: "Scotch is at the heart of Diageo and this new investment reinforces our ongoing commitment to growing our Scotch whisky brands and supporting Scotland's tourism industry. "For decades to come our distilleries will play a big role in attracting more international visitors to Scotland." Diageo now plans a tie-up with Scottish Enterprise and VisitScotland to promote Scotch and Scotland to potential visitors around the world. Before it was called Diageo, it was Guinness. With that stout in the company's portfolio, it took an old Dublin building, re-designed it to look something like a black pint with a white froth, and made it into Ireland's biggest paid-for visitor attraction. As Guinness has shown, an iconic brand has to backed by marketing. It may have lots of regular drinkers, but it always has to recruit new ones. The challenge is even greater when you've laid down nine million casks of whisky, as a bet on the consumer thirst being there for many years to come. Diageo gambled on the continued upward curve of demand from the emerging middle class. It spent more than £1bn on expanding capacity, two new mega-malt distilleries, warehousing and new bottling lines (while facing strong criticism for closing those where Johnnie Walker started out, in Kilmarnock). To that, it recently added the re-opening of ghost distilleries in Port Ellen and Brora. It is unlikely to get permission to acquire other companies, as it already has 40% of the Scotch industry. So deepening that market is the direction it's chosen to go, building stronger relationships with consumers and tapping into a growing interest in provenance, and consumption being as much about the product as the experience. It can pay off for the whole industry, and for Scotland's image abroad. But first, it's got to find the right site in Edinburgh. First Minister Nicola Sturgeon said: "This significant investment will not only help attract more tourists to Scotland, offering world-class visitor experiences, but it also underlines the fundamental importance of the whisky sector to Scotland's economy." Scottish Secretary David Mundell said whisky was "hugely important" to Scotland's economy. He added: "I welcome Diageo's major new investment. It is hugely exciting, not just for Scotland but for whisky drinkers around the world who want to learn more about the history and traditions of our national drink."